This article is about the maxilla in vertebrates. For arthropod maxillae, see Maxilla (arthropod mouthpart). Front view. Maxilla visible at center, in green. The maxilla (plural: maxillae /mækˈsɪliː/) in animals is the upper fixed bone of the jaw formed from the fusion of two maxillary bones. The upper jaw includes the hard palate in the front of the mouth. The two maxillary bones are fused at the intermaxillary suture, forming the anterior nasal spine. This is similar to the mandible (lower jaw), which is also a fusion of two mandibular bones at the mandibular symphysis. The mandible is the movable part of the jaw. seven of the face: the nasal, zygomatic, lacrimal, inferior nasal concha, palatine, vomer, and the adjacent fused maxilla. Sometimes it articulates with the orbital surface, and sometimes with the lateral pterygoid plate of the sphenoid. Figure 5: Anterior surface of maxilla at birth. Figure 6: Inferior surface of maxilla at birth. The maxilla is ossified in membrane. Mall and Fawcett maintain that it is ossified from two centers only, one for the maxilla proper and one for the premaxilla. These centers appear during the sixth week of prenatal development and unite in the beginning of the third month, but the suture between the two portions persists on the palate until nearly middle life. Mall states that the frontal process is developed from both centers. The maxillary sinus appears as a shallow groove on the nasal surface of the bone about the fourth month of development, but does not reach its full size until after the second dentition. and a sixth, the infravomerine, lies between the palatine and premaxillary centers and beneath the vomer; this center, together with the corresponding center of the opposite bone, separates the incisive canals from each other. At birth the transverse and antero-posterior diameters of the bone are each greater than the vertical. The frontal process is well-marked and the body of the bone consists of little more than the alveolar process, the teeth sockets reaching almost to the floor of the orbit. 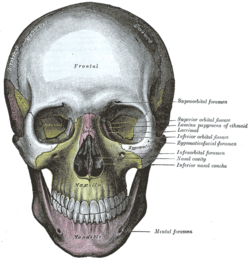 The maxillary sinus presents the appearance of a furrow on the lateral wall of the nose. In the adult the vertical diameter is the greatest, owing to the development of the alveolar process and the increase in size of the sinus. The alveolar process of the maxillae holds the upper teeth, and is referred to as the maxillary arch. Each maxilla attaches laterally to the zygomatic bones (cheek bones). Each maxilla also enters into the formation of two fossae: the infratemporal and pterygopalatine, and two fissures, the inferior orbital and pterygomaxillary. -When the tender bones of the upper jaw and lower nostril are severely or repetitively damaged, at any age the surrounding cartilage can begin to deteriorate just as it does after death. Maxilla fractures is a form of facial fracture caused by a fracture. A maxilla fracture is often the result of facial trauma such as violence, falls or automobile accidents. Maxilla fractures are classified according to the Le Fort classification. Sometimes (e.g. in bony fish), the maxilla is called "upper maxilla", with the mandible being the "lower maxilla". Conversely, in birds the upper jaw is often called "upper mandible". In most vertebrates, the foremost part of the upper jaw, to which the incisors are attached in mammals consists of a separate pair of bones, the premaxillae. These fuse with the maxilla proper to form the bone found in humans, and some other mammals. In bony fish, amphibians, and reptiles, both maxilla and premaxilla are relatively plate-like bones, forming only the sides of the upper jaw, and part of the face, with the premaxilla also forming the lower boundary of the nostrils. However, in mammals, the bones have curved inward, creating the palatine process and thereby also forming part of the roof of the mouth. Birds do not have a maxilla in the strict sense; the corresponding part of their beaks (mainly consisting of the premaxilla) is called "upper mandible". Cartilaginous fish, such as sharks, also lack a true maxilla. Their upper jaw is instead formed from a cartilaginous bar that is not homologous with the bone found in other vertebrates. Skull. Maxilla shown in green. ^ Fehrenbach; Herring (2012). Illustrated Anatomy of the Head and Neck. Elsevier. p. 55. ISBN 978-1-4377-2419-6. ^ Mall, Franklin P. (1906). "On ossification centers in human embryos less than one hundred days old". American Journal of Anatomy. 5 (4): 433–458. doi:10.1002/aja.1000050403. ^ Fawcett, Edward (1911). "Some Notes on the Epiphyses of the Ribs". Journal of Anatomy and Physiology. 45 (Pt 2): 172–178. PMC 1288875. PMID 17232872. ^ a b Romer, Alfred Sherwood; Parsons, Thomas S. (1977). The Vertebrate Body. Philadelphia, PA: Holt-Saunders International. pp. 217–43. ISBN 0-03-910284-X. Sicher, Harry; Du Brul, E. Lloyd (1975). Oral Anatomy (6th ed.). St. Louis: Mosby. ISBN 0-8016-4604-9. Worthington, Philip; Evans, John R., eds. (1994). Controversies in Oral & Maxillofacial Surgery. Saunders. ISBN 0-7216-3099-5.